If filtering your Google+ stream by circles isn't enough for you, check out a new Chrome extension that lets you filter posts in and out of your stream by keywords. After you download the extension, you'll get a tab where you can input your keywords. The top box is for words you want to exclude, the bottom for words to include [ see above ]. Click the "add" button next to either box and a pop-up box will appear. Enter keywords like "technology" or "cats" (with our without hashtags) and separate them with commas. When you're done, hit "add" and the words will appear in the box. To remove a word, make sure it's highlighted and then click the "remove" button. Be sure to hit the "save" button on the bottom right when you've got your filters set up. 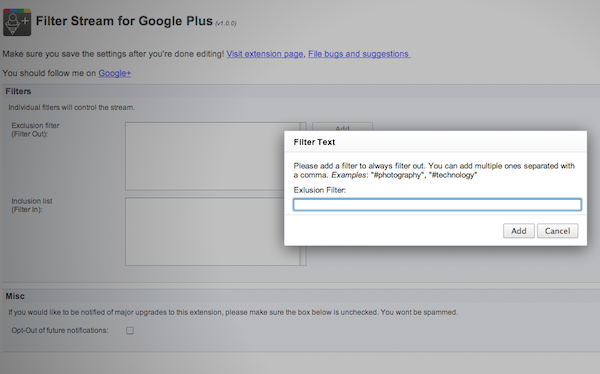 Refresh your Google+ stream for the filters to work. Developer Mohamed Mansour, who has made a number of Chrome extensions for Google+ already, notes that filtered-out posts should appear in the popup icon next to the wrench button in the top-right of your Google+ page. Of course, you won't know what's filtered out until a post with that keyword comes through. The downside of the extension, as one reviewer points out: you have to disable it to turn it off. "Just the option to right click and turn it on or off would be awesome," writes CB Photography.